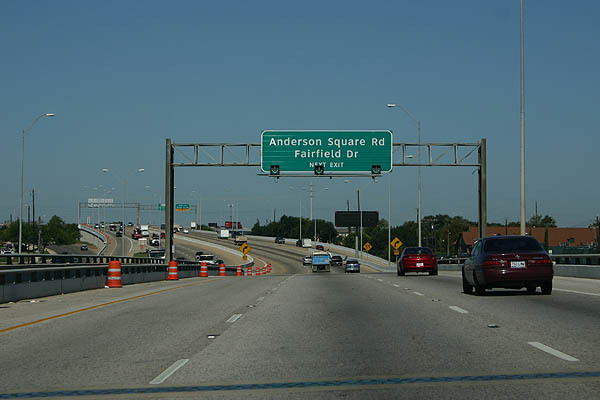 West of IH 35, the first exit serves Anderson Square Road and Fairfield Road. Photo taken 09/27/06. 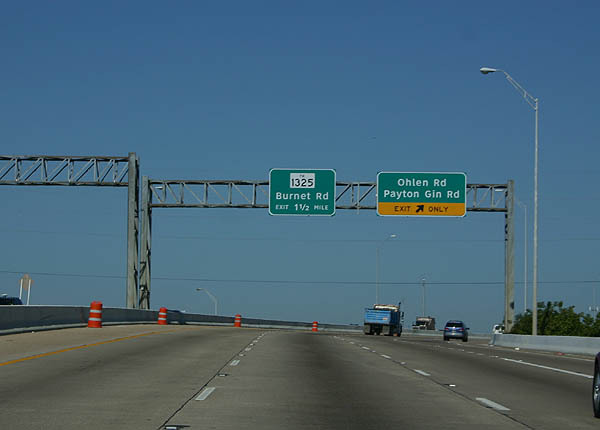 The first exit west of IH 35 is Ohlen Road and Payton Gin Road. Photo taken 09/27/06. US 183 is on an elevated viaduct west of IH 35. This was built in the late 1990s to avoid heavy commercial development. Photo taken 09/27/06. 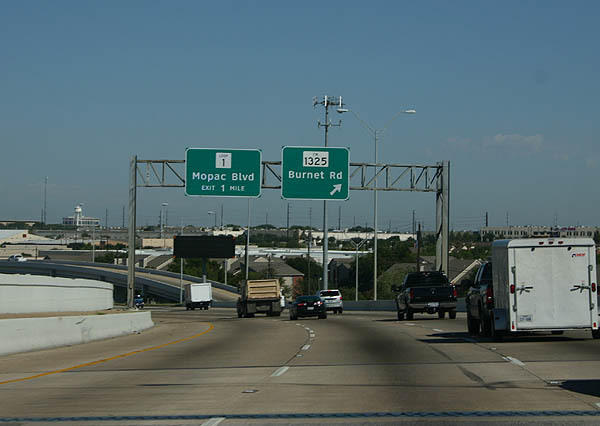 The next three exits are Burnet Road (FM 1325), Mopac Boulevard (Loop 1) and Capital of Texas Highway (Loop 360). Photo taken 09/27/06. FM 1325 departs here. 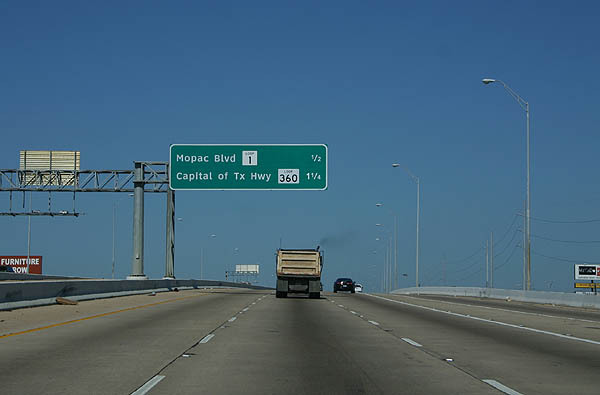 The next exit is MoPac Boulevard. Photo taken 09/27/06. 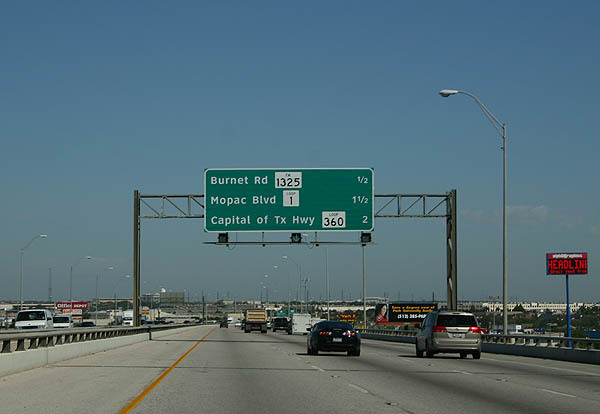 The next two exits are Mopac Boulevard and Capital of Texas Highway. We are on the 1997-vintage elevated highway here. Photo taken 09/27/06. Loop 1 (Mopac Boulevard) departs here. 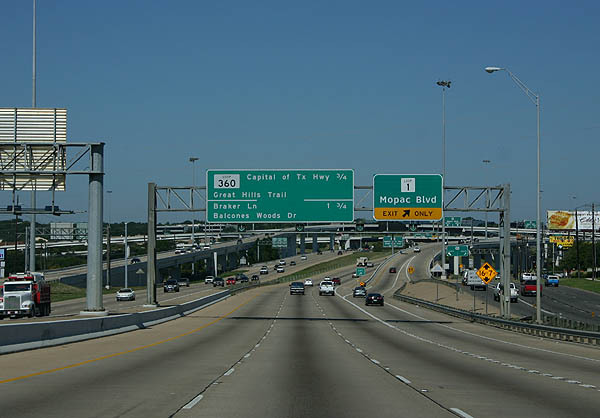 Loop 1 was Austin's first urban freeway. Photo taken 09/27/06. 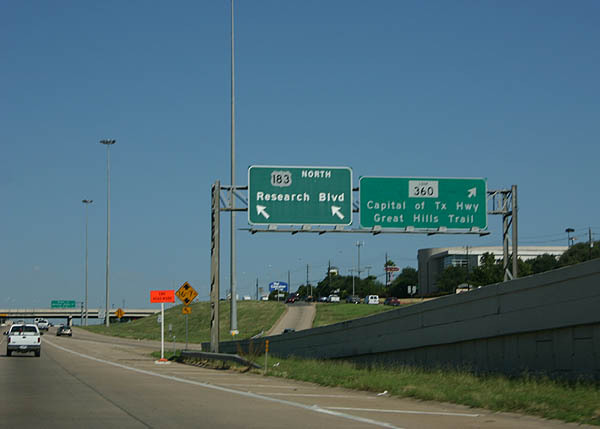 The next exit serves Loop 360, Capital of Texas Highway. Photo taken 09/27/06. Loop 360 departs here. 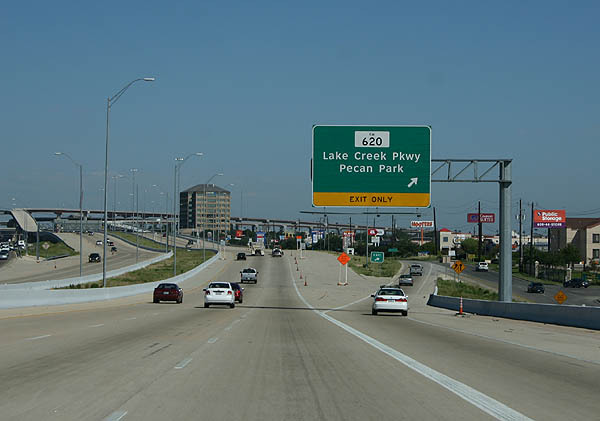 Loop 360 was originally planned to be a freeway, but was never built as a freeway. 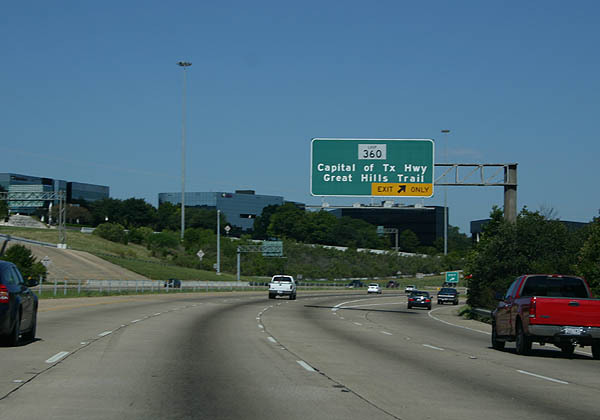 Many high-tech companies (such as Dell) are headquartered along Loop 360. Photo taken 09/27/06. 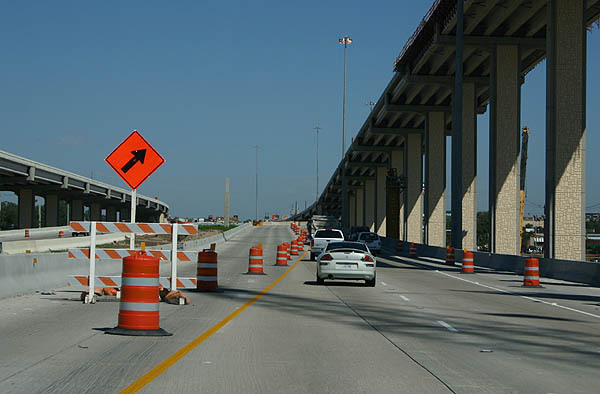 This C/D ramp brings traffic from Mopac Boulevard to US 183 northbound. Photo taken 09/27/06. 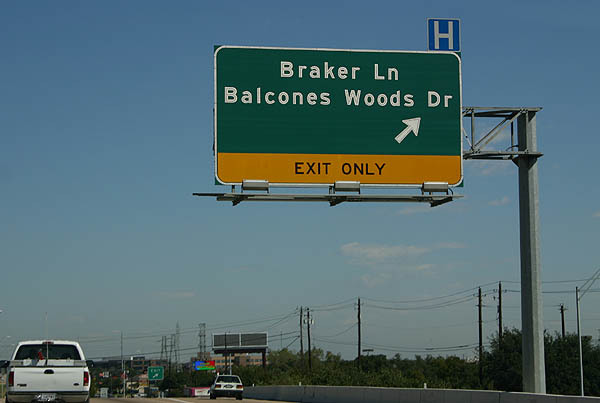 Advance signage for Braker Lane and Balcones Woods Drive. Photo taken 09/27/06. 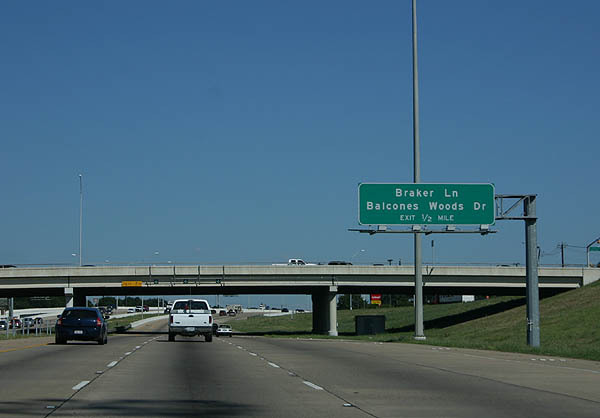 Braker Lane and Balcones Woods Drive exit here. Photo taken 09/27/06. 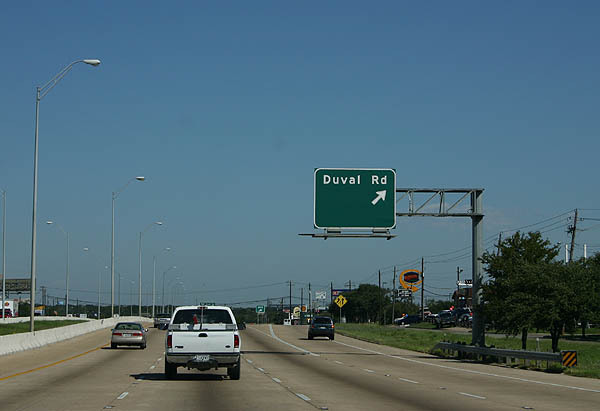 Advance signage for Duval Road. Photo taken 09/27/06. 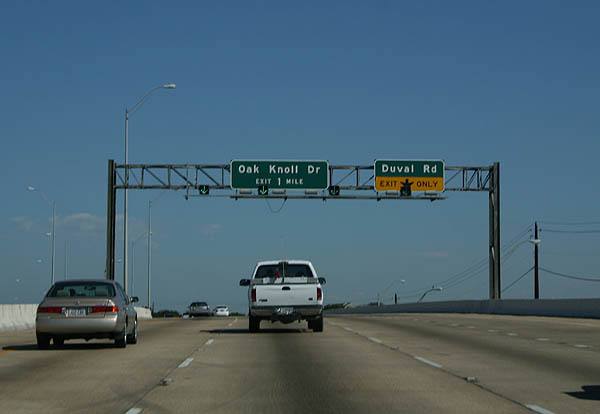 The right lane departs to Duval Road. The next exit is Oak Knoll Drive. Photo taken 09/27/06. 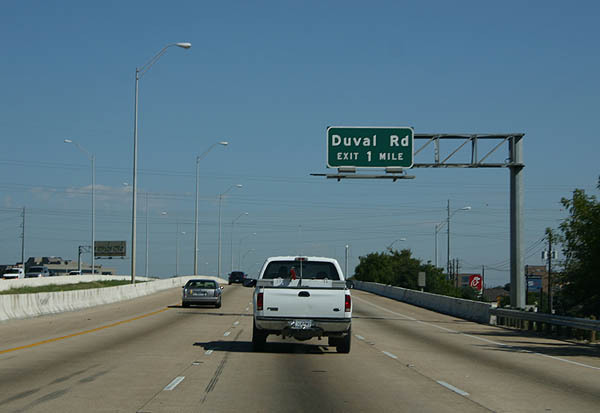 Duval Road departs here. Photo taken 09/27/06. 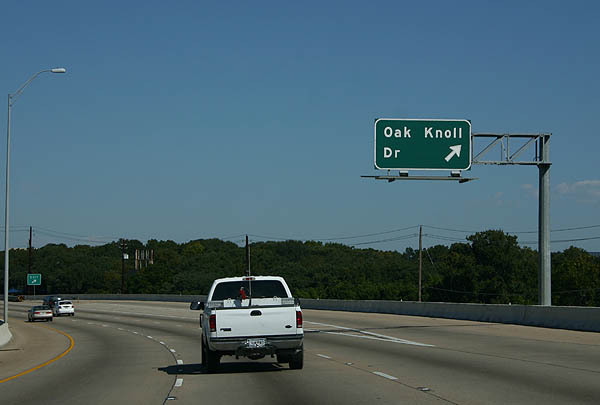 The next exit serves Oak Knoll Drive. We are travelling along the Balcones Escarpment, marking the edge of Hill Country. Photo taken 09/27/06. 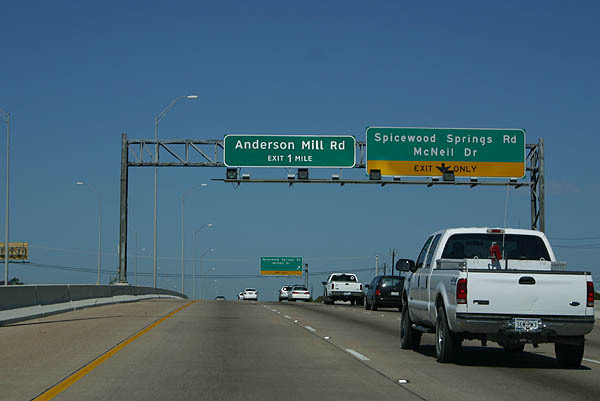 Advance signage for Spicewood Springs Road and McNeil Drive. 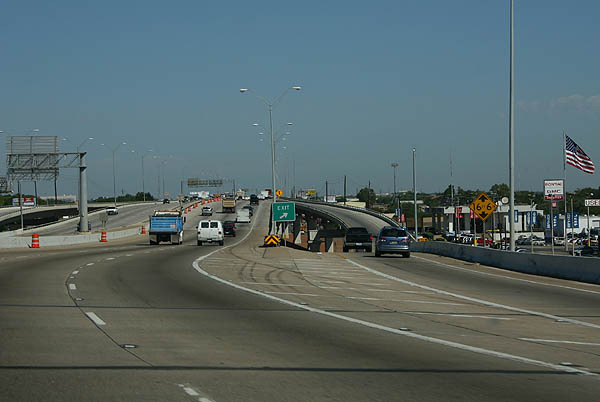 US 183 is built as a six lane freeway, with a wide median between Jersey barriers. Photo taken 09/27/06. 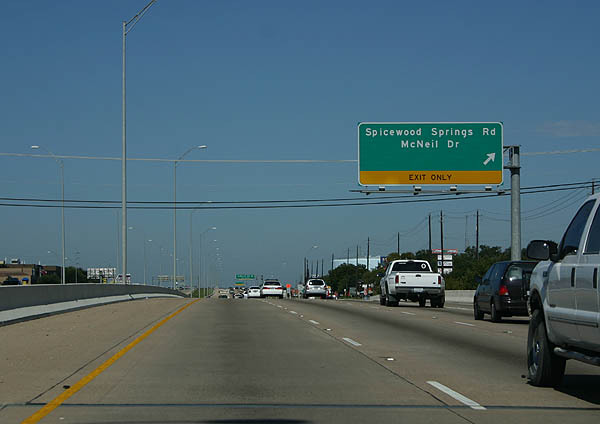 The right lane exits to Spicewood Springs Road and McNeil Drive. Photo taken 09/27/06. 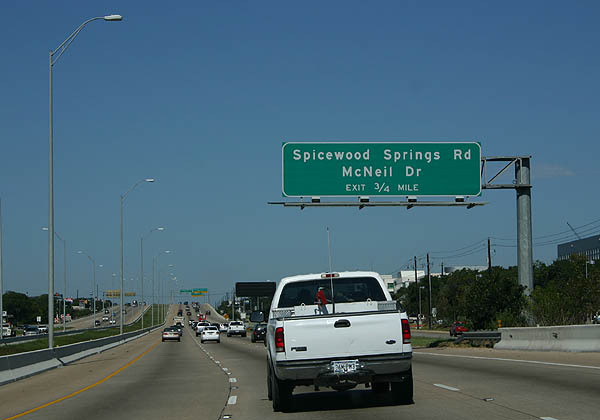 Spicewood Springs Road and McNeil Drive exit here. Photo taken 09/27/06. 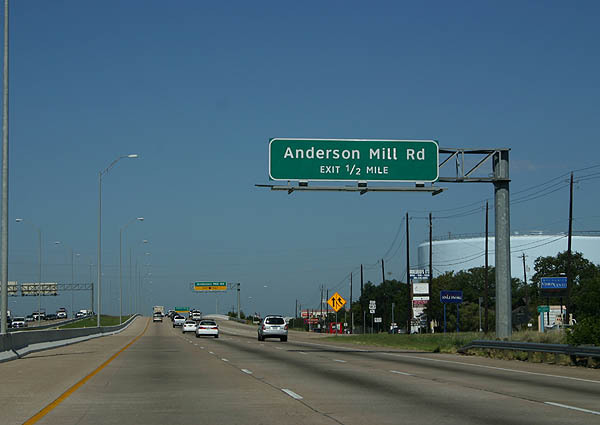 Advance signage for Anderson Mill Road. Photo taken 09/27/06. 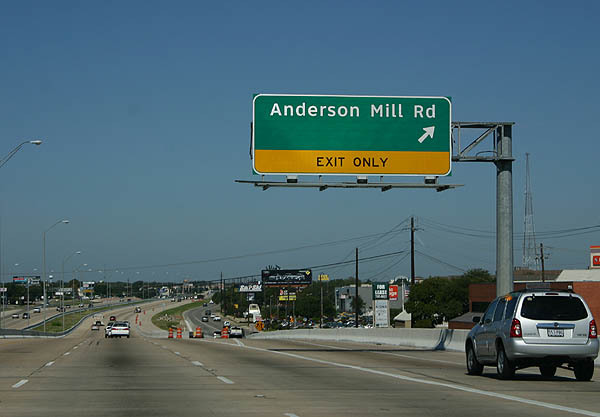 Anderson Mill Road exits here. Photo taken 09/27/06. 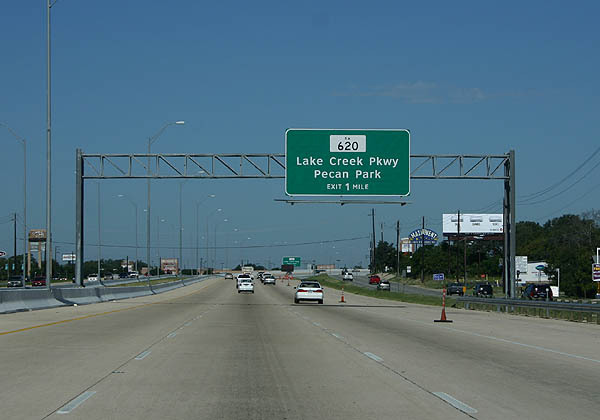 Advance signage for FM 620, Lake Creek Parkway and Pecan Park. Photo taken 09/27/06. 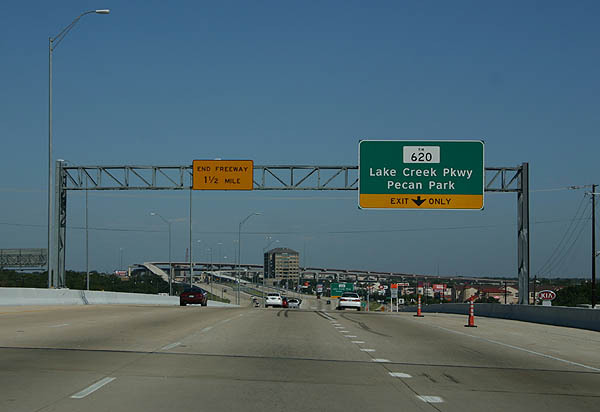 The right lane exits to FM 620. FM 620 serves a major shopping area. 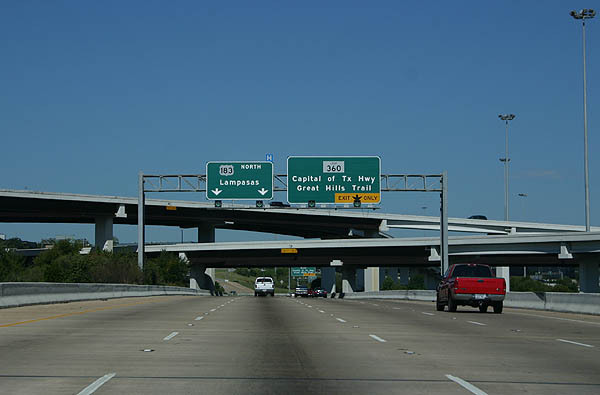 The US 183 freeway ends ahead. Photo taken 09/27/06. FM 620 departs here for Lake Creek Parkway. At the time these photos were taken, this was the last exit before the freeway ends. Photo taken 09/27/06. 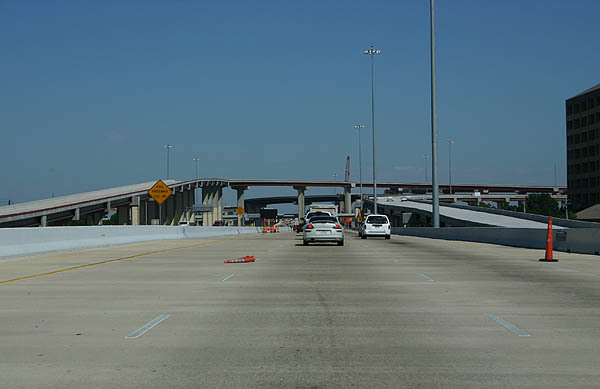 The ramps in this three level interchange serve the SH 45 Tollway. Photo taken 09/27/06. US 183 exits from the freeway here. The freeway construction north of here is part of Toll 183A. Photo taken 09/27/06. 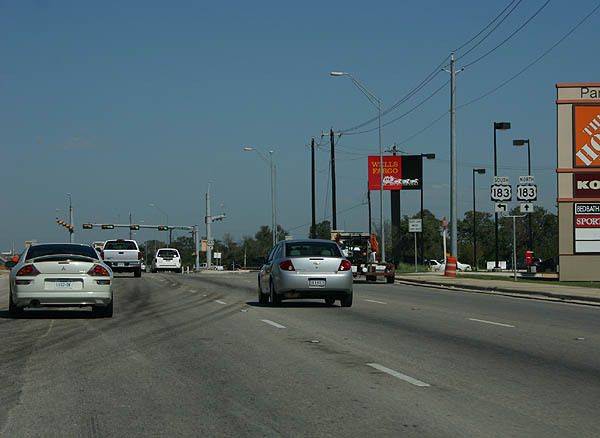 US 183 reverts to a frontage road configuration after leaving the freeway. Photo taken 09/27/06.